Today has been low key, but monumental yet again! She has slept most of the day, only to wake for a few things. Her body is resting and hopefully healing. It was scary for the first few hours because she was almost unarousable, and she has been the same all day, but when she is awake she acts appropriately so there is no concern of a complication. Just rest and healing. I left for an hour or so today to do some laundry and shower at our new room at the RMH. Amazingly enough, we got the Mickey Mouse room that looks like a room at the Disneyland Hotel! It is AMAZING. Though it was hard going in and knowing Gabriella couldn't see it, I plan on taking tons of pictures for her. PLEASE call your local RMH and see how you can help. Stocking cabinets, donating unused but good condition household items, etc. They are a blessing to families like ours and I don't know what we'd do without them!!! They lowered her Dopamine to 3 from 5... that much closer to being off of it! Once she is off of it, we move to rehab and start the building process!!!! She woke for Elmo who came to visit her in honor of Sesame Street's birthday! She was semi-amused with the silly looking Elmo. She also (kinda) woke for a bath and to wash her hair. She slept through most of it, but it had to feel go to be clean. I got to sit in a chair and hold my baby. 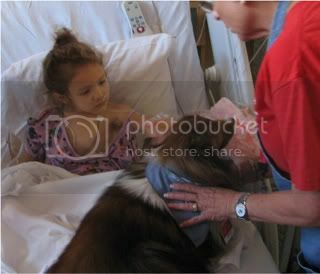 The therapy dog came to visit as well, and Gabriella perked up. We had Physical Therapy, also. And it was fantastic! She has no concerns with her walking. She will be great once we work some of those muscles. Her arm has some base muscle reactions, which we are going to immediately start strengthening. She has some purposeful movement and muscle flexing, so I am beyond thankful for that!!! she did a puzzle and practiced some movements. She got tired awfully quickly, but it was a profitable 10 minutes of rehab!!! And the best part is we got her a chair!!! Once she is off her Dopamine, we can take her for rides. It also gives her somewhere safe to sit while not in her bed- and to me thats huge. I hate that shes laying in a bed all day. And a funny part of the day.... she was asleep and looked up at me suddenly. She kept pointing to her table. I quizzed her as to what she wanted and discovered she wanted to paint. I guess when the artistic bug hits you, you must act! She painted for a few minutes and went back to sleep. Oh Kristi, I sit here and read this with tears of joy flowing down my face. What precious pictures. Thank you for sharing them. Thank you for the updates! God Bless you Kristi & Paul. We will continue praying for more! I think the sleeping is helpful, actually. The brain heals when it is resting. Such wonderful news, though, about her reactions! And YAY! for the chair... You are in my prayers, every second of every day. YAY!!!!!!!! I am so happy to read your blog post and LOVE seeing the pictures! More and more little mountains are going to equal a big one! I love you guys! Hang in there!!!! I am so THRILLED with her progress!!! WOW... what a rockstar!! I love that she wanted to paint. That room, the red wristband, the teal"ish" curtain... it's all too familiar. I'm all teary as well. Seeing all the pics just tugs at my mama heart. Oh my goodness. TOO FUNNY about needing to paint RIGHT THEN. Maybe she was dreaming artistic dreams. So sweet. What a big day. I am not at all surprised she was so tired after yesterday. She is such a fighter! You are so right, mama - all that sassafrass is paying off as she is focusing her energy on healing and recovery. Thank you for the pictures and update. Praying, praying, praying. 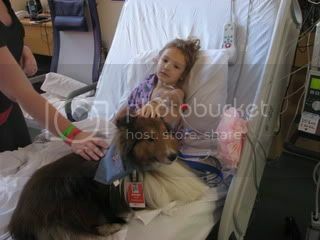 The therapy dog makes me so happy! It's nice to see something like a little puppy coming to visit her can perk her up that much, those pictures are so precious! Even though I havn't personally met Gabriella, I feel like I've known her since the day she was born! 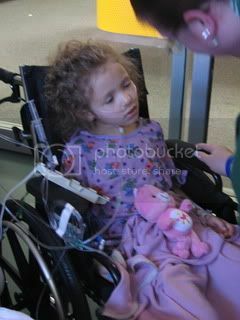 She is so precious, and I'm praying, praying, praying that she has a quick, painless full recovery! Kristi, i too can't go a day without checking several times on your blog. I think of G all day and pray often. Thank you for the pictures and help us all to be thankful for the blessings in our lives. She is truly an angel and we are all blessed to share her. Thank you for that and praise god for her accomplishments! I loved seeing the pictures. That one of you holding her is especially moving. I pray that her rest is healing and that she has a great night and day tomorrow. Baby steps! My heart goes out to you and your family. My thoughts and prayers are with you. 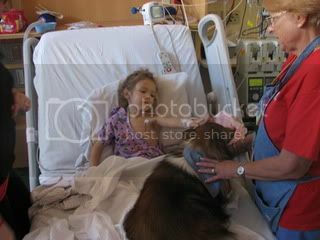 You as a her mother are amazing, you must be a rock, I have read your blog and unless someone has dealt with an illness of a child they don't understand what you are going through. 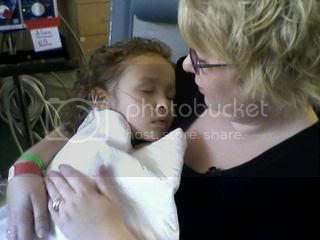 I myself have a grandson with luekemia and my daughter has got to be the rock and stay strong for her family. God Bless you all and I wish the best to Gabriella and your family. I don't know you and you don't know me, but your blog brings tears to my eyes everytime I read it. You are an amazing mom and Gabriella is a precious gift from God. I have been praying for your family. I hope everyday brings new growth for Gabriella. Keep fighting, you are an inspiration to everyone! Thats so awesome!! I love those pics, you holding her is too sweet. I'm sure that meant the world to both of you. Continuing prayers for you all. Both of mine are praying each time we say our prayers.